Bioproduct manufacturing is an emerging but fast-growing industry. It looks at innovatively converting natural renewable biological resources, such as wood and crop waste, into a wide range of value added chemicals, materials and energy. With the increasing challenges of resource scarcity and environmental pollution, there is a strong global demand for bioproduct engineers who can design sustainable and environmentally friendly materials and energy-efficient sources. 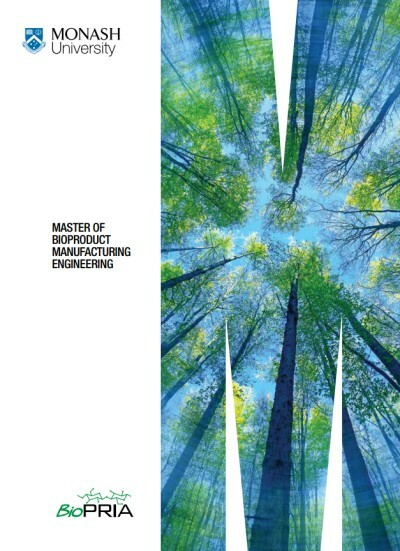 A qualification in bioproduct manufacturing engineering from Monash University provides you with an opportunity to pursue your passion for sustainability and innovation and be part of the growing bio futures industry. Gain a unique understanding of the bio-futures industry and the emerging economic, social and environmental benefits of converting renewal bio-based resources to sustainable products. The course equips you with skills to discover, design and develop sustainable engineering solutions to convert bioresources and waste streams into value add products such as biomaterials, bioenergy and bioproducts. * Relevant work experience in process engineering and related research and development. ** Applicants with a non-related discipline degree must demonstrate competency in applied maths and chemistry. If you are interested in enrolling in the Master of Bioproduct Manufacturing Engineering, please complete the below Expression of Interest form. Qualifications: Refer to entry requirements. Provide attachment of transcripts in PDF or Word format. Experience: Refer to entry requirements. Provide attachment of transcripts in PDF or Word format.